Still image from Bergara Experience video produced by Fear and Loading YouTube Channel. Wouldn’t it be great if rifle-makers offered demonstration days, where shooters could try out various rifles — with ammo provided? Yep, that would be nice. 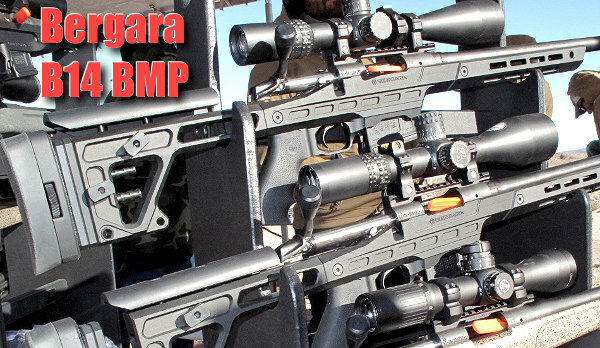 Well that’s exactly what Bergara Rifles USA has been doing with its Bergara Experience. We commend the company for offering these free “test drive” sessions, giving shooters a chance to test some impressive factory rifles. 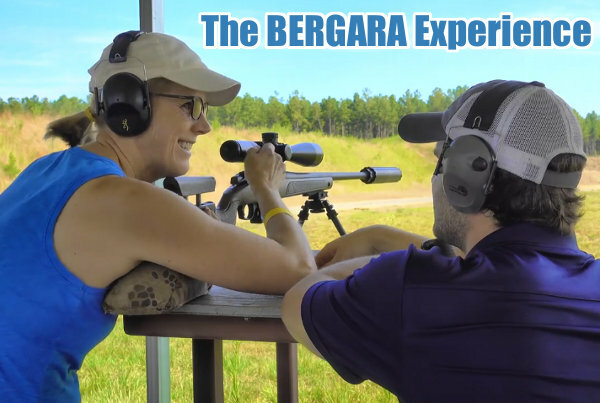 Bergara hosted three shooting demo sessions last month (August) in the Southeast USA. The first event took place at Woody’s Hunting and Rifle Club in New Hill, North Carolina on August 5th. 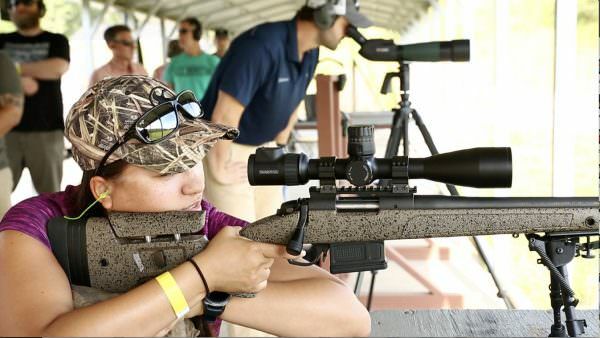 Next Bergara’s team hosted an event on August 19th at the White Feather Precision Shooting Range in Ardmore, Tennessee. 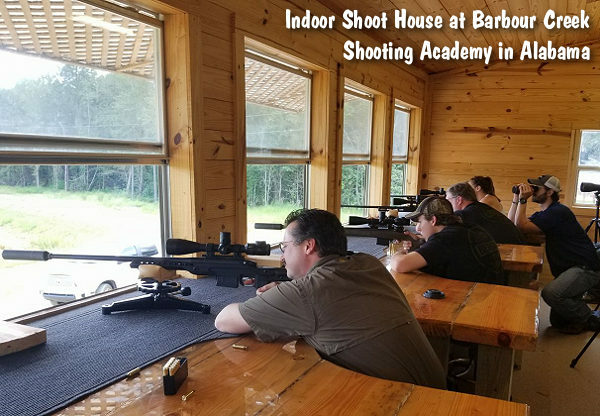 The final Bergara Experience in August was held on the 26th at the Barbour Creek Shooting Academy in Eufaula, Alabama. 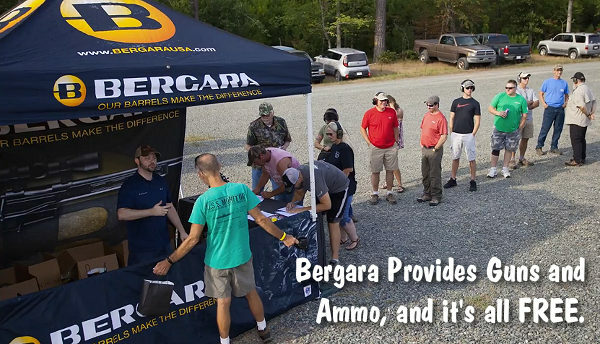 The video above was filmed at the inaugural Bergara Experience, in North Carolina. Shooters fired a variety of rifles both prone and from the bench. 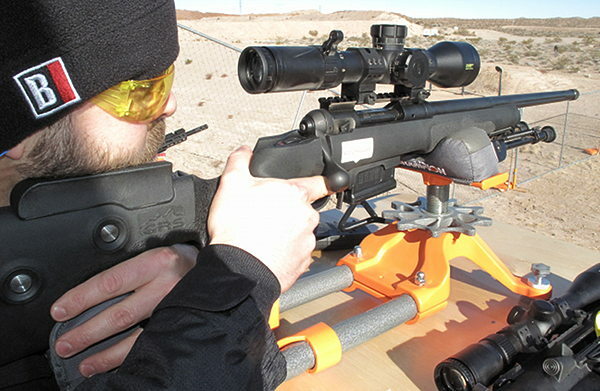 A crowd favorite was the precision B-14 HMR (see below) chambered in 6.5 Creedmoor — both with and without suppressors. Here’s video from the Barbour Creek Academy. This is an excellent facility with a covered shooting house and a range that runs out to 1,580 yards. 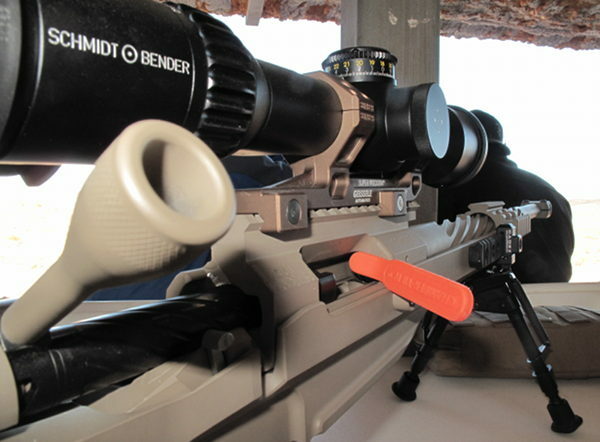 At Barbour Creek, shooters got to test the long range capabilities of Bergara rifles. 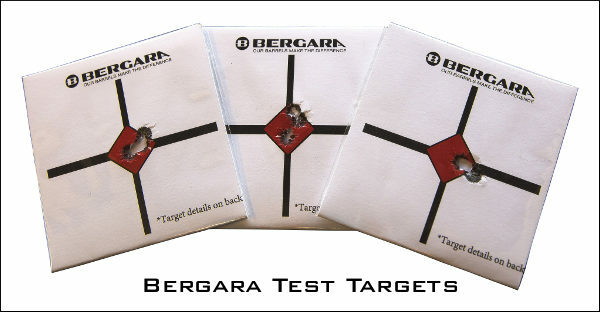 Bergara rifles all come with a test target (above). 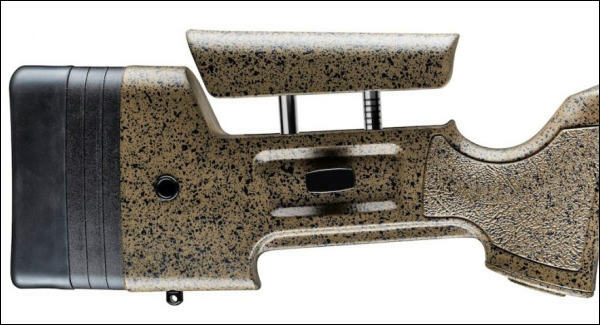 We thought it was interesting that Bergara uses a target we originally designed right here at AccurateShooter.com. This target features a central red diamond, with lines for your cross-hairs, thicker on the horizontal. Our version includes boxes to enter load data, MV, and group size below each aiming graphic. CLICK HERE to Download Target. 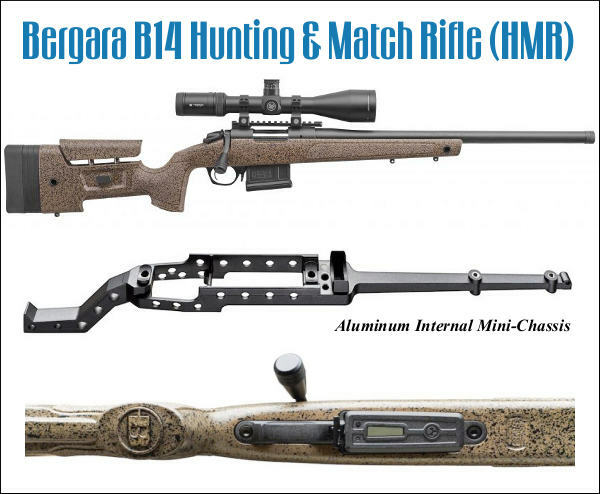 Share the post "Industry Trends: Bergara Offers Rifle Demo Days in August"
Shown is a new .338 Lapua Magnum rifle from Israel’s IWI. Impressively beefy rig. 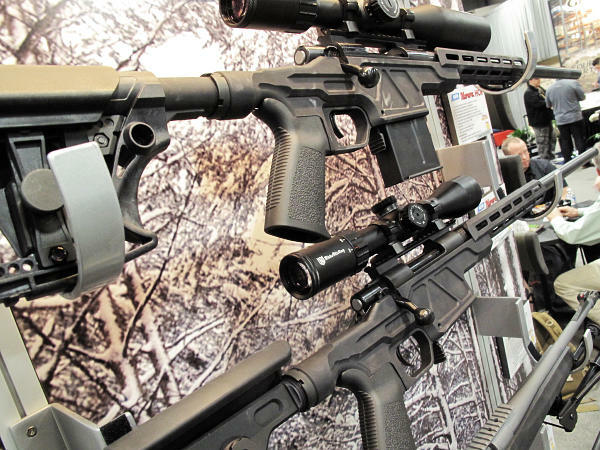 For folks in the gun industry, the third Monday in January is the best day of the year. 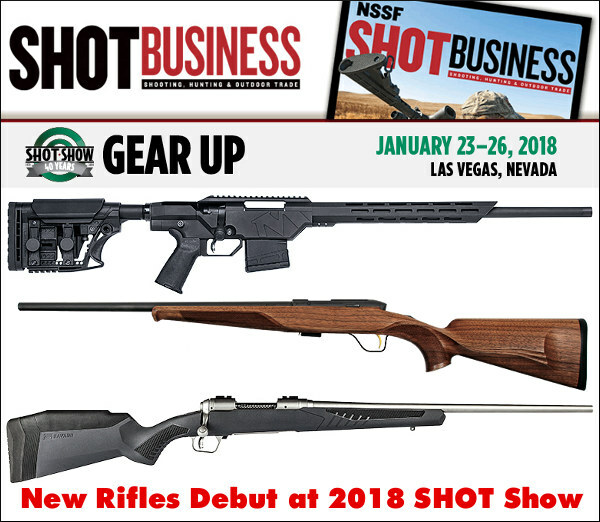 Held in conjunction with SHOT Show, Media Day at the Range lets us try out dozens of new rifles and pistols, as well as meet top gun designers and friends in the shooting sports. We saw some very interesting new products this year. Here are some of the most interesting “take-aways” from Media Day at the Range 2017 on January 16th. 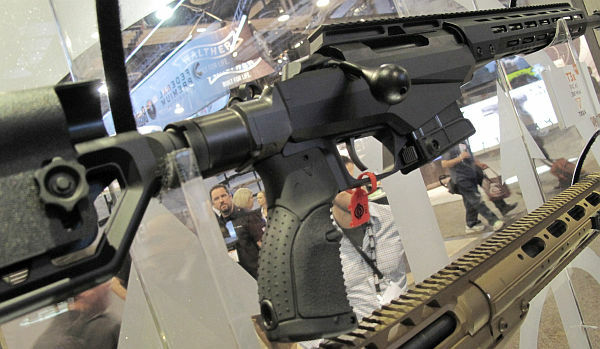 The star of Media Day, at least in the rifle category, was “The FIX”, a new modular rifle from the Q Team. This innovative rig features a totally unique bolt system with a 45° lift and a bolt housing that runs on rails (literally). This thing cycles fast and smoothly. The trigger, set at 2.5 pounds, was one of the best we’ve ever tried on a centerfire factory rifle. One has to admire the engineering on “The FIX”. 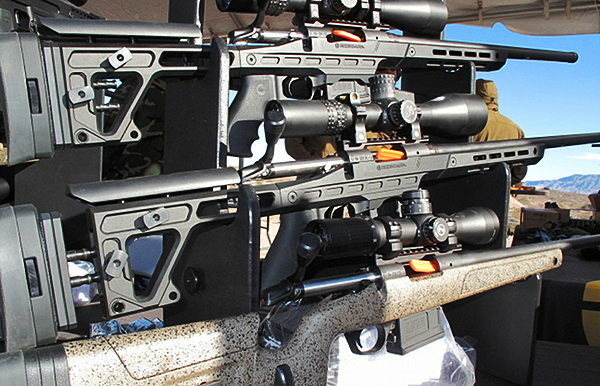 This new rifle has definitely “raised the bar” for tactical-style rifles. 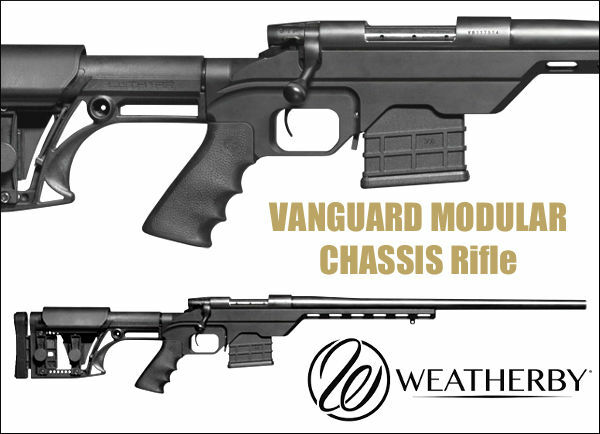 It’s different, it works, and it offers real advantages for both hunters and tactical style shooters. 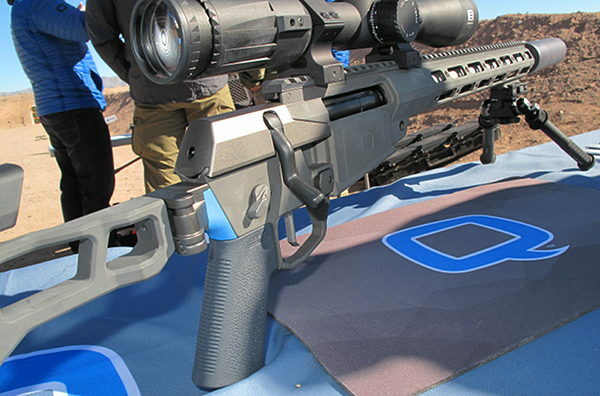 Perhaps the most ergonomic rifle we shot all day was the new Savage GRS-10 in a stiff, composite GRS stock. European-crafted GRS stocks feature a very comfortable hand-grip, plus fully adjustable cheek-piece and adjustable length of pull. 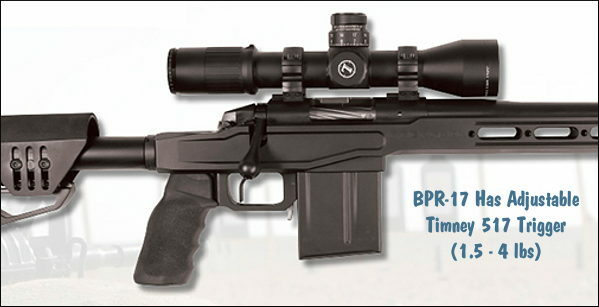 As shown this rifle is very affordable for PRS production-class competition. 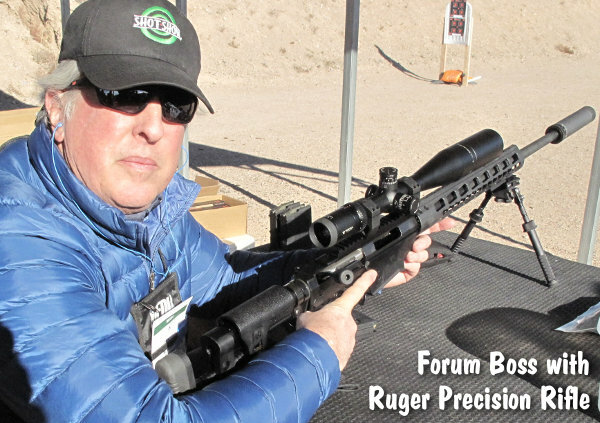 To be frank, this Editor liked this rifle more than the Ruger Precision Rifle. A lot more. The GRS stock fit better, the Savage bolt cycled much more smoothly, the trigger was better, and the magazine seated more easily. If you don’t have to be “tacticool” with a metal stock, you should definitely consider this Savage. 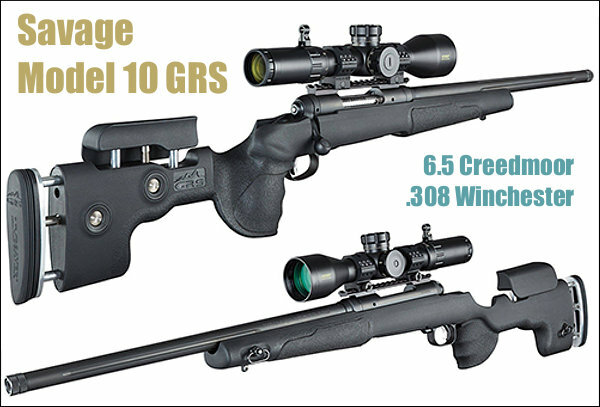 The new Savage GRS-10 will be offered in 6mm Creedmoor, 6.5 Creedmoor, and .308 Win chamberings. Here’s a video review by Guns America. 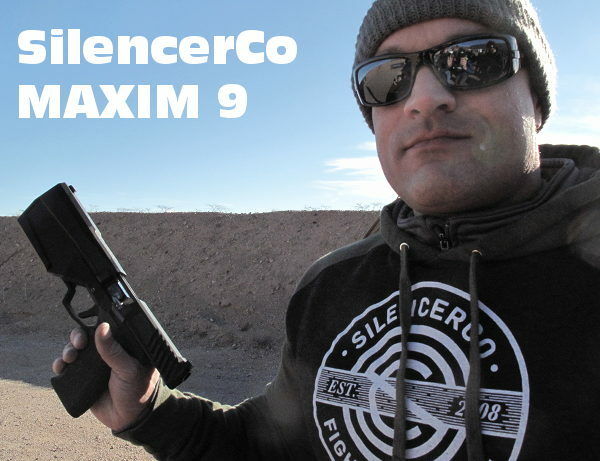 The most interesting handgun on display was SilencerCo’s Maxim 9, which features an integral suppressor. It looks bulky but it felt relatively normal in the hand. The silencer did tame muzzle lift as well as reduce sound levels dramatically. This is an impressive piece of engineering. There were many other pistols equipped with more conventional screw-on silencers. 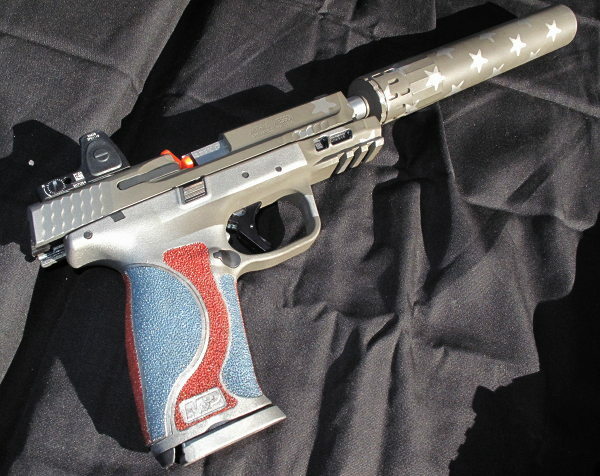 Here is a special edition Smith & Wesson M&P model. There were many new optics on display at Media Day, none more impressive than the new 5-45x56mm PMII from Schidmt & Bender. 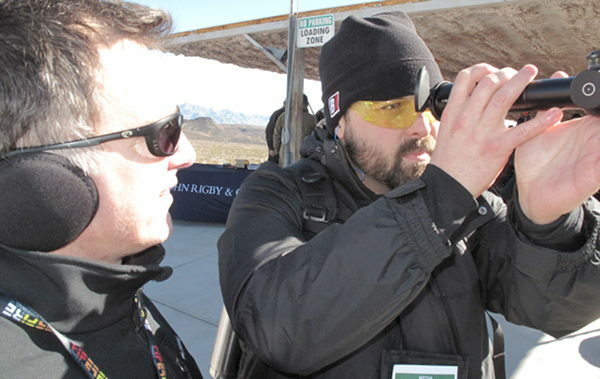 Led by our good friend Kyle Brown, Schmidt & Bender USA had a strong presence at Range Day, with many optics models fitted to high-end tactical rifles. 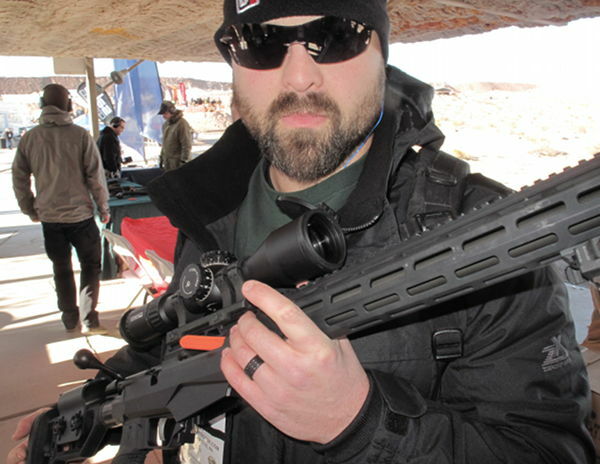 Jason Baney (shown below with Kyle), used one of these rifle/scope combos to make 5 of 5 hits on steel at 960 yards. Jason Baney checks out the new 5-45x56mm PM II with help from Kyle Brown (left). One of the great things about Media Day is the chance to re-connect with old friends. At the Winchester booth, it was great to see Kim Rhode, a six-time Olympic medalist (including three golds). She is the first Summer Olympian to win an individual medal at six consecutive summer games. Kim, a Californian, is leading efforts to challenge draconian new California laws that will severely restrict how ammo is distributed and sold in California. 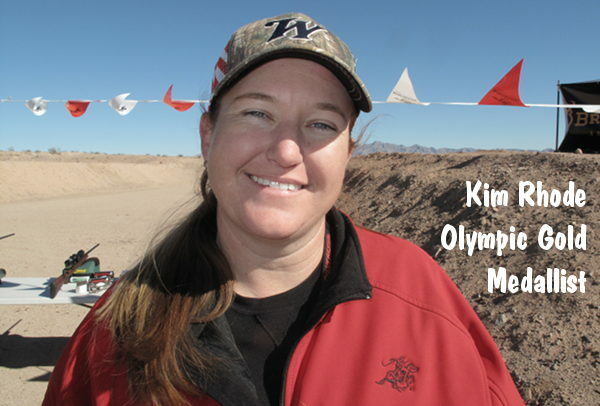 Kim said that, under the new ammo laws, she will not be able to obtain the special “International Loads” she shoots in competition. We wish Kim well in her efforts. We believe that California’s new laws restricting the purchase of ammunition are unconstitutional and, hopefully, will be challenged successfully in court. 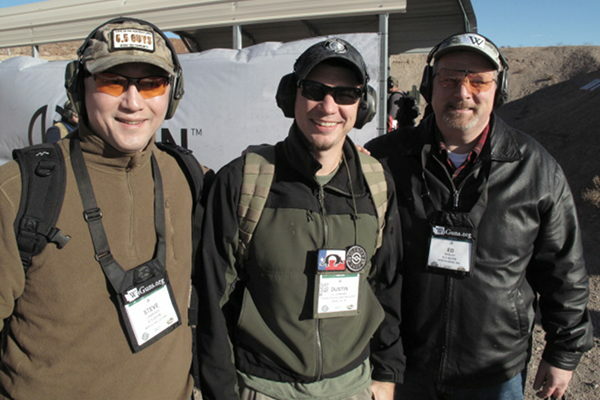 Along with Kim we met with our friends Steve (L) and Ed (R), aka the 6.5 Guys, along with past Top Shot Champion Dustin Ellermann (in middle below). 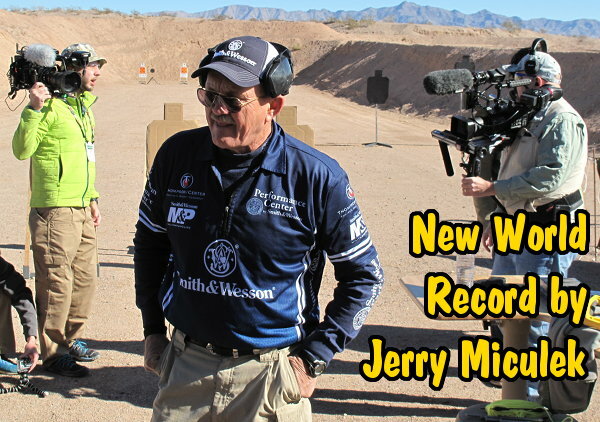 At the Smith & Wesson shooting bay, we watched the legendary Jerry Miculek set a world speed record for 10 rifle rounds total on three targets. Before a cheering gallery of fans, Jerry drilled multiple sub-two second runs using his S&W M&P 15T semi-auto rifle. The fastest split was a 1.59 (but we’re waiting for final confirmation on that). We’re told that’s definitely a new world record. Jerry may not be getting any younger, but he’s still blazing fast. Jerry calls this 10-shot drill “STL” or Share the Love. 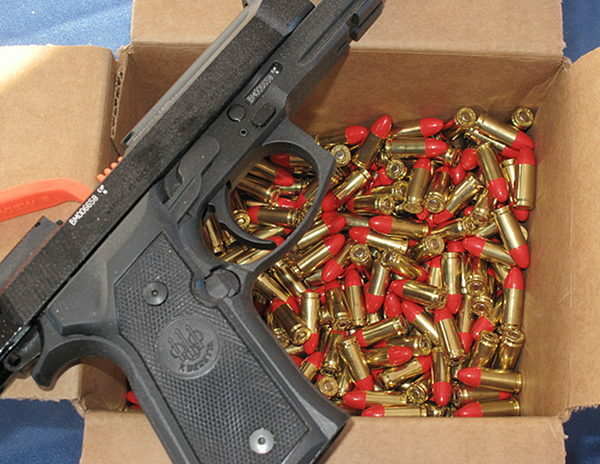 One of the more notable, recent developments in pistol ammo has been synthetic jacketed bullets. With a total polymer shell over a lead core, these are safer when shooting steel targets because they do not fragment like conventional, jacketed bullets. With no exposed lead or copper, there’s minimal contact between these materials and the barrel, so there’s less copper and lead fouling. Moreover, according to Federal’s test engineers, the red Syntech coating produced 12% less friction in the barrel. Here is the American Eagle 9mm Luger 115gr Total Syntec Jacketed ammo provided by Beretta at Media Day. 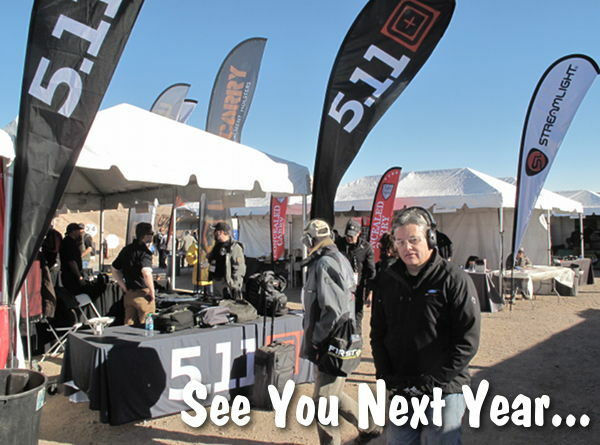 And that’s a wrap… now on to SHOT Show. 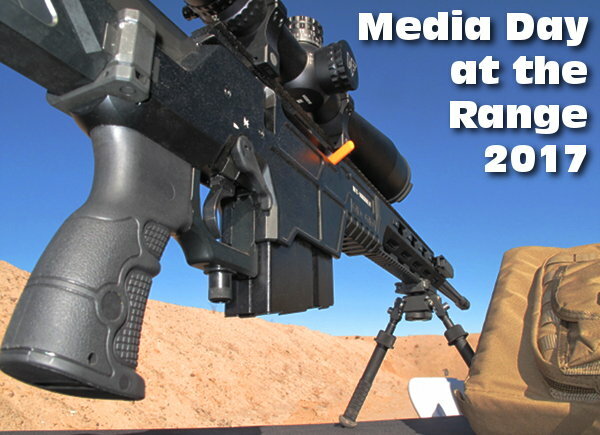 Share the post "Media Day at the Range 2017 — Highlights"